A corrections officer watching over 110 prisoners at a high-security penitentiary in Coleman, Fla., hesitated before opening the cell of an apparently drunken inmate. He called over the sole officer presiding over 113 inmates in a nearby unit for backup. Neither officer was armed, complying with federal prison guidelines. Together they unlocked the cell. That's when the prisoner's sober cellmate attacked, breaking the first officer's nose and knocking the second to the ground, kicking in his teeth and not relenting until backup forces arrived to subdue him. The incident, which occurred on Jan. 8 at the Coleman Federal Correctional Complex, is not an outlier. Dale Deshotel, president of the Council of Prison Locals, estimates there were 100 incidents of inmate assaults on correctional officers in 2011, a number he says has climbed as units have become overcrowded and staffing has reduced. An officer at the Federal Correction Institution in Oakdale, La., from 1986 to 2007, Deshotel now is fighting to draw attention to events like the Coleman assault, which he says are becoming more frequent because of federal prison cutbacks. "It's just too much work put on too few people, and something's going to break," he told Government Executive. "Something has to break." Five days prior to Coleman, two inmates at the SeaTac Federal Detention Center about 15 miles south of Seattle attacked a guard, an Iraq War veteran, who suffered skull fractures and was subsequently hospitalized. The officer underwent surgery and expects to start therapy soon. One SeaTac inmate was armed with a padlock stuffed inside a sock. "We give them the padlocks so they can store their property so no one else can steal it. And then they assault us with them," Deshotel said. The details of the assaults all come from Deshotel, who would not reveal the names of any of the parties involved. Edmund Ross, spokesman for the Federal Bureau of Prisons, gave a similar account of the SeaTac story, and relayed the official Coleman account, which differs slightly from Deshotel's: "Two correctional officers were assaulted by an inmate while they were escorting him from his cell." Ross also added that BOP referred both incidents to the FBI. "The safety of our staff is our top priority and we will continue to work closely with the FBI and the U.S. attorney's office to ensure that inmates who engage in assaultive behavior are prosecuted and held accountable for their actions," Ross told Government Executive. 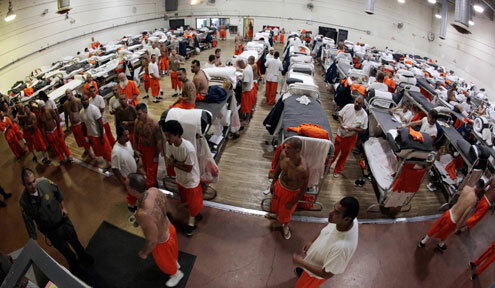 Spurred by the two events and their proximity, CPL, a division of the American Federation of Government Employees, released a statementTuesday, expressing outrage at the lack of adequate prison staffing during the incidents and demanding additional funds and staff for federal prisons. BOP's policy toward arming on-duty officers is one factor at play. In the federal prison system, guards typically do not carry weapons because of concerns that inmates could steal them. Guards don't even carry pepper spray; though lipstick-sized containers sell on Amazon for $3, in federal prison the substance is kept in its own locked cabinet, accessible only if a lieutenant or captain gives clearance. The Government Accountability Office already had taken note of this and in April 2011 issued a report on officer safety concerns. The report questioned, among other things, the pepper spray policy, noting officers at state prisons are allowed to carry the substance while on duty but federal prison officers are not. At the time GAO issued a recommendation to BOP to research whether the equipment it was providing to officers for their safety was proving effective, and BOP agreed to do so. Inmates act with impunity around officers, confident that the lack of resources will keep them from being disciplined, Deshotel said. The more disruptive ones may be sent to special housing units where the officers carry breakaway batons, but in cases where only one unarmed officer is overseeing as many as 150 inmates, keeping order falls to a lower priority than keeping sane. Years ago, Deshotel said, there used to be two officers overseeing a single unit, and every officer would know every inmate's name. In 2005, a cost-reducing initiative known to prison workers as "Mission Critical" cut the federal prison workforce primarily through attrition, and the results essentially left every one officer with the workload of two. "They say that it's manageable and we disagreed with that from the very beginning," he said. That means the officers have more difficulty conducting everyday duties like basic cell sweeps. In the case of Coleman, Deshotel said the inmate was drunk off hooch, which prisoners typically make by smuggling moldy bread and sugar packets out of the dining hall, combining them in a garbage bag, and hiding the mixture for at least three days, until it ferments. Like hooch, inmate violence is the fermentation of many unpleasant elements sitting unacknowledged in a prison cell for extended periods of time. "We don't have the money anymore and this population is continually growing," Deshotel said. "We're netting 6,000 inmates a year . . . Right now I don't see the end in sight and we don't have the facilities." Before Mission Critical, an inmate who put his hands on an officer usually netted a minimum of five years in a high-security penitentiary. Now, inmates such as the ones who attacked at Coleman and SeaTac often get off scot-free. On Jan. 3, the Justice Department, which oversees BOP, officially instituted Charles Samuels Jr. as the bureau's new leader. In a release on Dec. 21, 2011, Attorney General Eric Holder expressed confidence that Samuels would "increase efficiency" and "allow for transparency and accountability at the Federal Bureau of Prisons." CPL officers met with Samuels on Wednesday morning, and Deshotel said he felt "optimistic" about the new leadership. "He's interested in the policy changes and hiring more staff, but he's got to work within the resources that we have," Deshotel said. Inside the cash-strapped BOP, those resources are dwindling by the day. Stay up-to-date with federal news alerts and analysis - sign up for GovExec's email newsletters.